Whether you are planning to paint a cabinet or to seal coat a floor, you may need to remove the earlier finishes, smooth the washboard, and/or eliminate previous damage that would compromise the elegant finish you desire. Removing carpeting frequently reveals unsightly nail holes and stains on floors. When you bring a piece of furniture home, you often have to properly prepare it to avoid such damage. Taking the time to rid the defects on pieces is more than worth the effort. Regardless of the project to be undertaken, there are a number of ways to prepare a piece. Preparation is sometimes executed chemically through the usage of solvents, but this technique often leaves traces of color or dings from rough usage. Most folks use sandpaper to complete the preparation. Using a course grade of sandpaper such as #80 grit sandpaper is an effective method for evening out undesired marks made in the factory or gouges from previous owners. Using a #180 grade sandpaper takes off just a bit more with each pass to end up with a smooth finish that is ready to paint. Those looking for a more reliable quality result often opt to use power sanders. The larger the project or the more damaged the wood is, the more helpful a power sander can be to the overall look of the finished item. Power sanders are available for every pocketbook and in every size. There are orbital floor sanders for cleaning whole rooms and handheld orbital sanders with rectangular bases that will get into small square corners. You might see pigtail-shaped scratches using these. Random-orbit sanders yield a smoother sanding pattern. These handheld units typically have variable speeds and come with a clutch to stop the action when it is removed from the wood. A carpenter might choose a belt sander. Some belt sanders have the motor in line with the sanding action; others have motors aligned perpendicularly to it. Other features found in these units are different grit sanding belts, a sanding frame to keep from gouging the wood, a retractable hood, and a dust-collection bag. Finishing sanders sometimes have an oscillating head with a triangular pad to get into small areas. A kit that comes with this unit there might contain a variety of heads for different jobs. A drum sander is constructed with a different design. They are often attached to a bench and work on wood much wider than their drum. Closed drum machines are more powerful than their less expensive, open-frame counterparts. When you are ready to invest in a power sander for your woodwork, you need to consider many variables. You want a tool that you can use for the task at hand as well as the future projects you will pursue. If it is too big or too awkward to handle, don’t settle for it — choose another one. A little flexibility in the speed and grade of the sandpaper will make it more adaptable. When you are looking for the sander worth you investment, don’t limit your browsing to an all-in-one mass market store. Consider seeking a manufacturer with a proven history of meeting the needs of customers. Festool is such a company. It was founded almost a century ago in 1925 when it started making chainsaws that could be carried into the environment. By 1951, they had developed the first Rutscher vibrating sander. This kind of innovation and development has made them an industry leader in large and small woodworking projects. With the increasing environmental awareness, they made the first random orbit sander that included the dust extraction in 1976. The gear-driven ROTEX line, launched in 1982, combined three functions into a single machine. These multi-mode sanders excel in adaptability to various woodworking projects. ROTEX sanders move from coarse sanding to fine sanding with the flick of a switch, and the sanding head is free enough to be easily angled into the tightest corners. In the 1990s, Festool moved into cordless equipment and docking stations. With the new millennium, they consolidated their brand and strengthened their commitment to dealers that specialize in woodwork, providing the best tools available today. Festool equipment always has a 30 day money back guarantee. They believe that your satisfaction is primary. Tools also have a three year warranty, so this ninety-year-old company stands by their products for the long haul. They even cover the shipping costs during the first warranty year. Festool sanders and other products can be purchased both in woodworking stores and online. The Festool website can direct you to retail outlets and catalog order sites in your area. Their state of the art sanders are guaranteed to maximally contribute to your woodworking pleasure and will help you achieve the look you desire for your project. 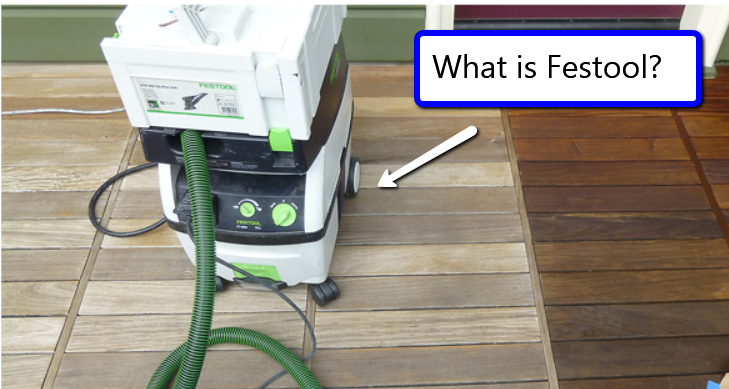 Dust-extraction equipment is connected to all Festool power tools, contributing to a healthier environment for the woodworkers and a cleaner work area at the end of the project. Capturing the dust during sanding is important for the machine operator’s health and keeps the airborne particles from getting into the motors and gears of the equipment. Extending the life of your investment in power tools makes your woodworking adventures whether professional or leisure more productive. Many of these dust-extractors are HEPA certified for institutional use. Recent developments at Festool have yielded several new product lines aimed at improving user experience even more. A number of their advancements have been made based on customer feedback. New router tables and work lights attest to the way they listen to the needs of those using their products already. Their dust extractors are now being built with an auto-clean feature to create even more easiness for the user. Some items apply oils; others remove wallpaper in ways that do not destroy the wall. The PLANTEX drywall sander takes their expertise in wood sanders into a new area. Festool is a company that has been attempting to reach out to as many people as they can. Regional fairs aimed at home builders and renovators often feature Festool distributors. Sometimes, people can’t convinced about the quality of the product until they try it themselves, so at these fairs you can hold the equipment in your hands see the difference in quality up-close. The distributors can answer questions you have about any of the products you may be interested in. In the longer shows, they will often execute a sanding project so that attendees can note their progress over a couple of days. When you bring your new sander home, the Festool website can be used to access a large array of support directed at both novice and experienced woodworkers. They have numerous product manuals and tutorials available online. Their online owners group is quite active with multiple topics posted regularly. Helpful tips are available on YouTube, Facebook, Twitter, and their blog. Videos are often posted on their blog to aid craftsmen and to alert followers of upcoming regional events. Festool is revered for the quality life of their woodworking equipment across the country. Given Festool’s company history, the size of the Festool Owners Group, and their nationwide network of distributors, you can confidently purchase a Festool sander that meets your needs and that will help you develop your working skills for decades to come. Previous post: What is Akzo Nobel?